Just as a tide of canceled orders has prompted Airbus SE to halt production of the A380 superjumbo, Japan’s biggest airline is betting it can succeed where others have failed — by filling the luxurious double-deckers with tourists flying to Hawaii. From May 24, ANA Holdings Inc. has scheduled three flights a week from Narita airport near Tokyo to Honolulu on the 520-seat behemoths, painted in a special sea-turtle theme. 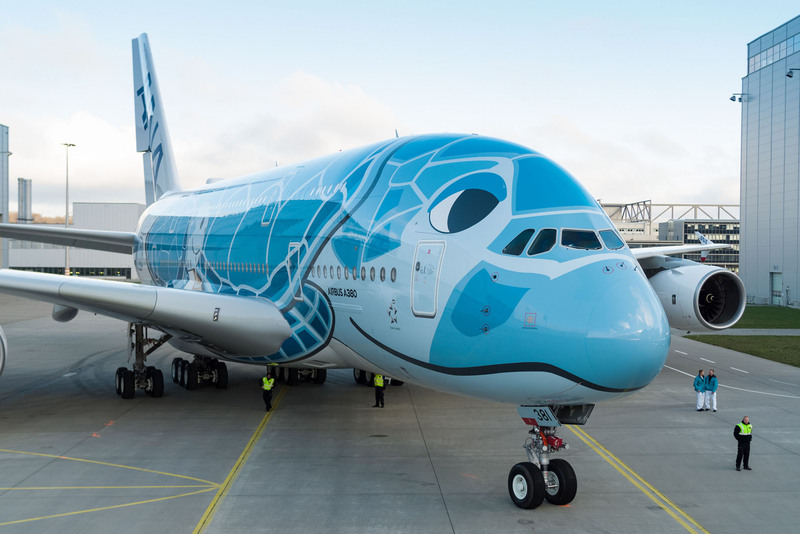 The carrier will bring on one more A380 for the Hawaii service in July and a third next year, ANA President Yuji Hirako said, adding that reservations for the route are already more than 40 percent higher than a year ago. 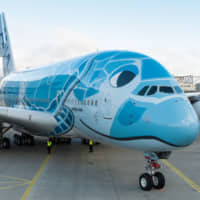 The plan leaves ANA as the only passenger line with A380s on order other than Dubai-based Emirates, which has been the plane’s mainstay airline. The aircraft — which wowed travelers with in-flight showers, bedrooms and bars but was too big to win over most carriers — may help ANA close the Hawaii market-share gap with arch-rival Japan Airlines Co. Still, some question whether the carrier can keep filling the plane once the novelty wears off. Japan Airlines has counted on Hawaii and the route has become one of the few where it surpasses ANA. JAL, as the airline is known, replaced ANA in a code-share partnership with Hawaiian Airlines in March last year and controls about 33 percent of the Japan-Hawaii air travel market, compared with about 14 percent for ANA, according to JAL. Even with the added capacity, ANA won’t directly challenge JAL on some Hawaii routes. JAL offers Japan’s only direct flights to Kona, a hot spot on Hawaii’s largest island, and schedules service to Honolulu from the Japanese capital and cities including Osaka and Nagoya. ANA said adding the plane will help it compete. “We are introducing all three of our A380s on the Hawaii route because we want to dominate that in terms of market share,” ANA Chief Executive Officer Shinya Katanozaka told reporters last week. After a dozen years in service Airbus last month decided it will stop making the A380 in 2021, burying a prestige project that faded as airlines grew to prefer smaller, more fuel-efficient aircraft. Such efficient, twin-engine planes that use lighter material, such as carbon fiber, have undermined demand for the world’s largest passenger airliner — a guzzler powered by four turbines. ANA allocated the superjumbos to the Honolulu route in 2016 with a plan to start flying two of them this year. The A380s will gradually replace the 787s it currently flies to the mid-Pacific islands in a bet that first- and business-class seating on the massive planes can help draw more, and higher-paying, fliers. “That kind of customer drops a lot of money at the destination,” ANA’s Hirako said. Local officials in Hawaii welcome that trend, he added, because they want to boost the islands’ image as a high-end vacation option.